The Perfect Vehicle? Why, That’s A Car With Truck Bed, Surely? Throughout the muscle car era, manufacturers fitted high-performing large displacement V-8 engines in their sporty coupes. 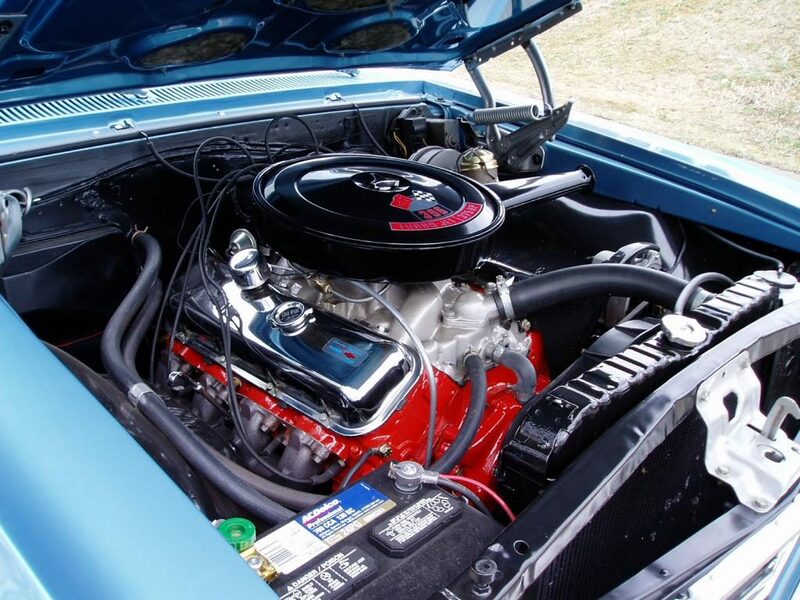 At the same time, they installed many of the same engines into models like the and Ranchero, creating street machines just as potent as a or a . In looking back through that era it became clear that there were both significant and interesting car+truck combinations worth sharing. 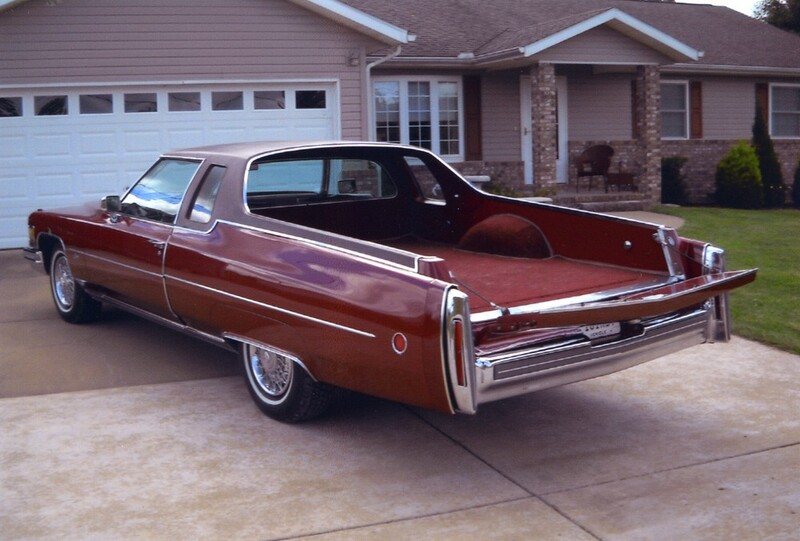 During the 1975 to 1976 model year, a with ‘s massive 500 CID V-8 could be ordered with a fully-carpeted custom body pickup. The Cadillac Mirage Pickup offered all the utility of a traditional half-ton pickup, including the ability to carry a 4′ x 8’ sheet of plywood in its bed, but with a great deal more style. An aluminum cover for the full bed was available, to secure cargo and keep away prying eyes. Built by Traditional Coach Works of Chatsworth, CA, the Mirage was the civilian version of what the company sold to funeral homes as “flower cars” (which would accompany the hearse from the service to the grave site). Give TCW’s strong relationship with Cadillac, the Mirage received the GM luxury division’s stamp of approval and the Mirage could be sold through Cadillac dealers. Of the total of 234 built in that time period, one was owned by stuntman Evel Knevel, and another by singer Glenn Campbell. Manufactured from 1982 to 1984, the was based on the front-wheel drive with its 2.2L four-cylinder producing 96 HP. In 1984, the Rampage’s final production year, a special edition was built at the Santa Fe Springs production line (who were then building high performance models for ) and sold through a select number of California dealerships. These Rampages were finished in three of the four colors offered on the Shelby Charger and with a Shelby upper front grille and lower spoiler, Shelby belt line and lower strips. They also received the close-ratio 5-speed transmission and quick ratio rack and pinion steering, and the 15″ aluminum wheels “pizza wheels,” from the 1984 Shelby Charger. The engine remained stock and there was no Shelby identification on the trucks. 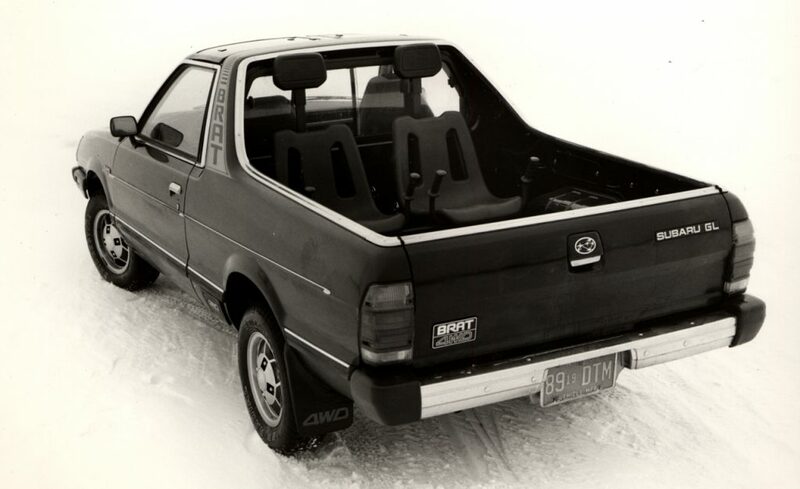 The 82 Brat was a Bi-Drive All-Terrain vehicle. While only boasting a 1.8 liter engine with 71 horsepower, it was still a beast in our book. In 1985 they removed the jump seats but there were still a few amazing options such as a spring loaded hidden door and a t-top split roof. They also mounted the spare tire under the hood. While coming into production as competition to the rising popularity of small foreign trucks by and it didn’t last too long as they stopped importing them to North America in 1987. Introduced in December 1956, the Ranchero was the very first car-based pick-up truck that utilized a single shell construction (that is the cab and the bed could not be separated). The Ranchero was based on the standard and new-for-1957 full-size Ford platform with an open, reinforced bed, its own unique rear window and integrated cab and cargo box. 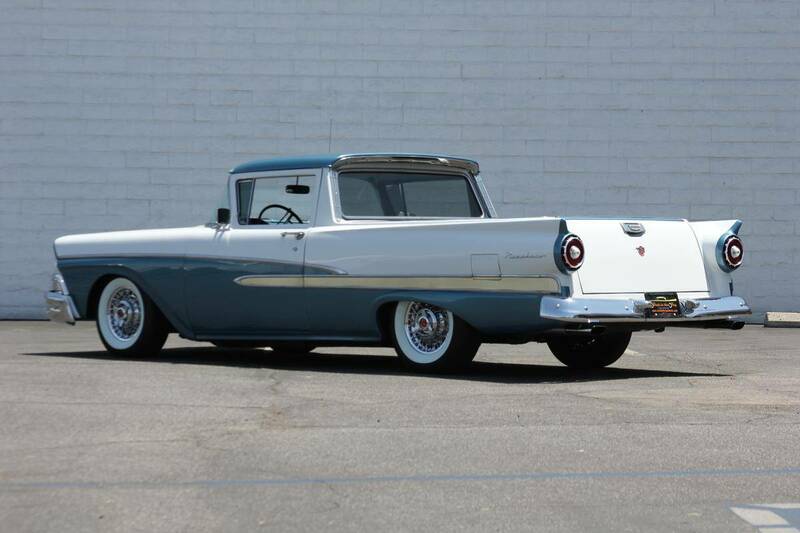 Ranchero was initially offered in two trim levels and, throughout the model run, was built on the corresponding automobile assembly line but sold as a truck through Ford’s truck division. There was an extremely basic standard model, marketed to traditional pickup truck buyers such as farmers, and the Custom which included options and accessories, including stainless steel side trim and two-tone paint. Thing were not too exciting under the hood until Ford made available to purchasers the Thunderbird 352 V-8 with four barrel carburetor producing 300 HP. For 1966, GM upped the ante with the introduction of a to the lineup, the top rated motor producing 375 HP. The L-78 motor was the first application of ‘s big block in the El Camino. The motor featured a 800 cfm Holley four barrel carburetor, 11:1 compression, forged pop-top pistons, aluminum high-rise intake manifold, steel crankshaft, solid lifter cam, square port closed chamber heads, and four-bolt main caps. Appearance-wise, front styling was changed to match the Chevelle forward of the B-pillars. Inside, a new instrument panel with horizontal sweep speedometer was featured. The standard version featured a bench seat interior and rubber floor mat from the lower-line Chevelle 300 series, while the Custom used a more upscale interior from the Chevelle Malibu with plusher cloth-and-vinyl or all-vinyl bench seats and deep twist carpeting, or optional Strato swivel bucket seats (that spins toward the open door) with a center console. seemed to be all over the place with how to size and position the Ranchero. The Ranchero started out based on a full-sized car, then shrank to become part of the Falcon family (both body on frame construction) to the intermediate Fairlane (a unibody design) and finally midsize (and back to body on frame). While just a two year excursion into unibodies, the preferred vintage is 1969 as the 428 CID 410 HP Cobra Jet V-8 was available for the full model year. The 428 also came with heavy-duty suspension components, aluminum valve covers, chrome engine parts, a heavy-duty radiator, an 80-amp battery and “428” badges. Sporty Fairlane trim options, bucket seats, a 4 speed Tremec “Toploader” transmission, and styled steel wheels were among the popular options available. 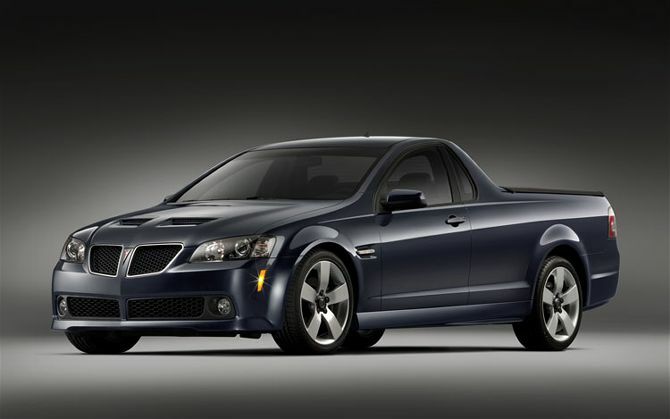 The G8 ST that was shown at the New York Auto Show in March of 2008 was based on the Holden Ute with a 73-inch cargo bed. The Sport Truck had the same 361 HP, 6.0L V8 used in the G8 GT, as well as the 3.6L, 256 HP V6. The G8 ST, set for release as part of the 2010 model line up, was to be Pontiac’s coupe utility, and GM’s first coupe utility in the United States since the El Camino was discontinued in 1987. However on April 27, 2009, GM officially announced that Pontiac would be dropped and that all of its remaining models would be phased out by the end of 2010. 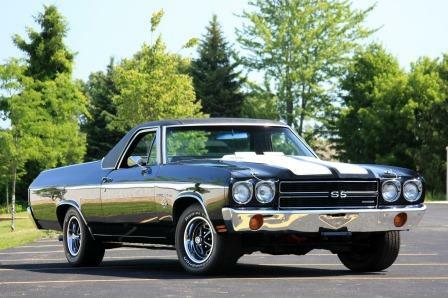 The 1970 El Caminos models featured a restyling that gave the bodies a more substantial, muscular appearance, and interiors were also redesigned. The new SS396, which actually displaced 402 cu in 6.6 L was available. Most importantly for our list, Chevrolet’s largest and most-powerful engine of the time was also put into a select few El Caminos. The V-8 LS6 454 CID engine, featured an 11.25:1 compression ratio, four-barrel carb, and low-rise aluminum manifold, rated at 450 hp and 500 lb·ft of torque, backed by either an M22 Rock Crusher close ratio four-speed or a TH-400 automatic. The lucky few owners who purchased the 7.4L monster motor could traverse the quarter in the low 13-second range, peaking at around 110 mph. 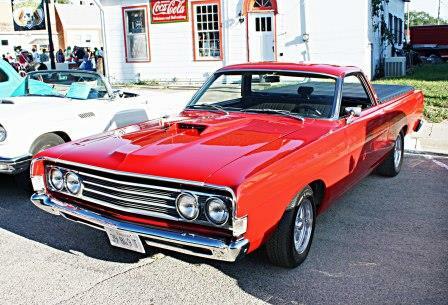 It’s a tough choice between the LS6 El Camino and a 429 Ford Ranchero. 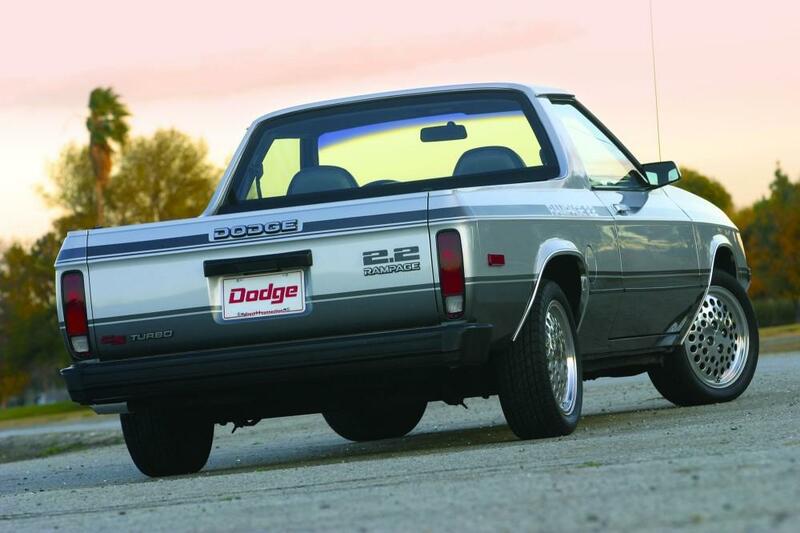 But when it’s the LS6 El Camino against three 429 Rancheros, the odds have to fall in the favor of the Ford. First, the Cobra Jet rated at 370 HP was equipped with a Rochester Quadrajet 700 CFM 4 barrel carb, aggressive cam, 11.3:1 compression ratio and a special set of cylinder heads. It was available with or without a hood scoop, and came with a highway-friendly 3.25:1 rear axle ratio. Second, the Cobra Jet – RamAir came with the shaker scoop, which was attached to the engine, and a 3.50 rear axle ratio. The Super Cobra Jet, rated at 375 HP (but most likely closer to 400 HP) had a 4-bolt main bearing block, a Holley 780 CFM four barrel carburetor, and an even more aggressive camshaft with mechanical lifters. Backing the up the 429 engines were one of four Tremec T-170 Toploader four-speeds transmissions, two of which had a 2.32:1 first, and two had a 2.78:1 first (Hurst shifter optional). At the back was the legendary available with a 3.91:1 or a drag strip ready 4.30:1 rear axle ratio. The Ford Traction-Lock limited slip differential was an option. Also optional were front disc brakes available, oddly enough, with or without power assist. On the exterior, a popular option on the Ranchero were the hideaway headlights. This vacuum operated system would open flip the panel over to expose the headlights when driving and return to the closed position when the car was turned off. The aggressive gearing available in both the transmission made up for any shortcomings against the Chevy Big Block. The Ranchero could run 0-60 mph in 5.3 seconds and cover the quarter mile in 12.3 sec topping out at 112 mph. 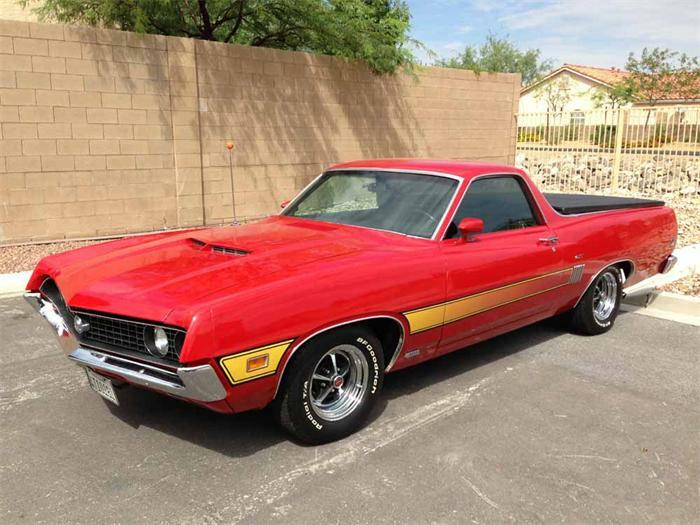 Given such a wide range of options with the enthusiast in mind, as well as its impressive drag strip performance, is why the 1970 Ford Ranchero Cobra Jet 429 was our top pick.